Before you even light up Villiger’s Kreme Connecticut, a quick sniff of the cigar will tip you off to the smooth and aromatic goodness that lies within. Comprised of Dominican Cuban-seed Criollo '98 fillers from Jochi Blanco's fertile fields concealed under a Dominican piloto ligero binder and flawless Ecuadorian CT wrapper, the Connecticut Kreme is the silky and savory smoke you’ve been waiting for, boasting perfect balance and a smoky, woody taste that is not to be missed. The Kreme Connecticut is like no Villiger cigar that’s come before. You’re in for a real treat. Overall a good cigar for the price! Nice flavor to this cigar and one that burns fairly slow. Aroma is nice and good taste. 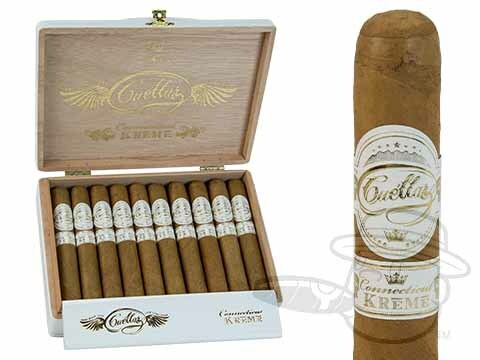 Connecticut Kreme Robusto By Villiger is rated 4.3 out of 5 based on 3 customer ratings.